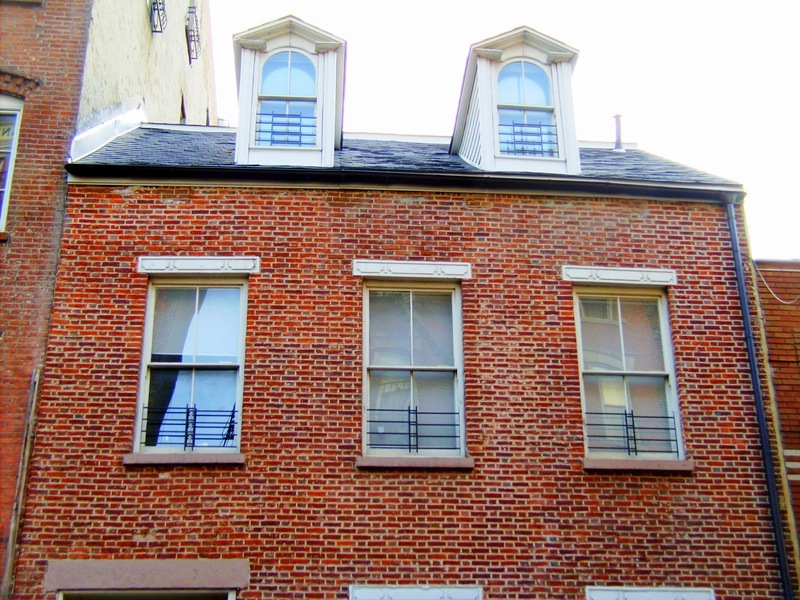 When Stephen Van Rensselaer built his modest two-story house at No. 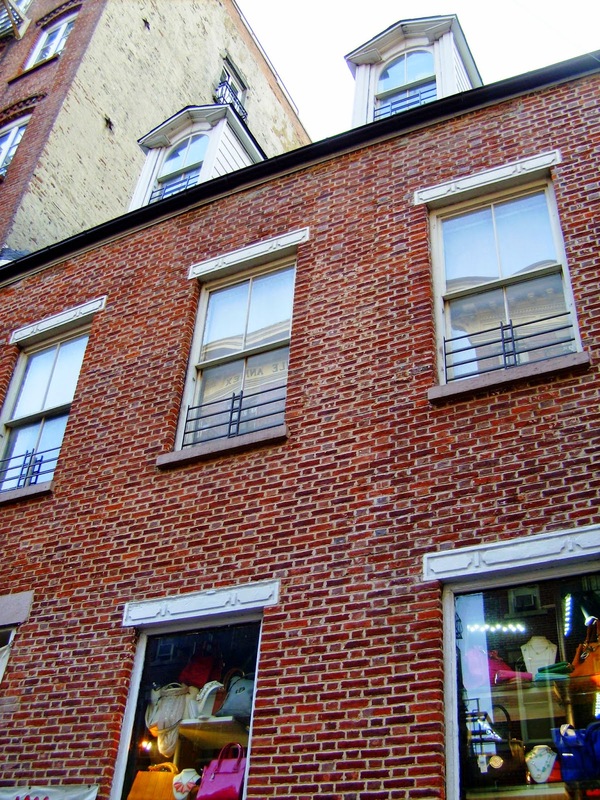 153 Mulberry Street in 1816, he was already 52 years old and had an impressive political (if not military) resume. Born into a highly prestigious and wealthy family—his father was Stephen van Rensselaer II, the 9th patron of Rensselaerswyck, and his mother was Catharina Livingston, daughter of Philip Livingston, a signer of the Declaration of Independence—he had studied at Princeton and Harvard University. In 1783 at the age of 19 he married Margarita Schuyler who, too, came from an old and highly respected family. Her father, Philip Schuyler was renowned as a Revolutionary War general. One year after Margarita’s death in 1801, Stephen married Cornelia Paterson, the daughter of former New Governor William Paterson, Cornelia. By now Stephen had sat in the New York State Assembly, the New York State Senate and had run for the office of New York State Governor. His decided defeat as major-general leading troops in the Battle of Queenston heights during the War of 1812 had led to the end of the military career. In 1816, the same year that the house was completed, Van Rensselaer was appointed to the Erie Canal Commission—a position he would hold for 23 years. He would go on to serve as a member of the New York State Constitutional Convention in 1821; be elected to the House of Representatives a year later; and was a regent of the University of the State of New York. Van Rensselaer was among the richest men in America with a fortune of about $10 million, equal to about $68 billion today. The family lived in on the sprawling 1,200 square mile Van Rensselaer estate which Stephen inherited from his father when he turned 21. But he owned an enormous portion of Manhattan real estate and the new house on Mulberry Street was part of it. The house was one of many Van Rensselaer erected in the area. There was nothing especially glamorous about the Federal-style residence; yet it was relatively spacious and acceptable for a fairly well-to-do merchant class family. Upon its completion it was assessed by the City for $3,750—about $60,000 today. Faced on three sides with wooded clapboards, the street façade was clad in Flemish bond brick. A tall stone stoop rose above the brownstone English basement to the entrance where Federal-style pilasters framed the paneled door. Side lights and an overlight allowed sunlight to illuminate the entrance hall inside. A Dutch-style gambrel roof was punctured by two tall dormers with broken pediments. The house stepped away from the commonplace with the wonderfully decorative paneled stone lintels. At least by 1837 the house was home to Noah Jarvis whom historian Charles Alexander Nelson described in 1911 as “a man of fine literary attainments and cultivated taste and enjoyed the society of men and culture and refinement.” Jarvis very well may have been the original owner. He was a trusted friend of Van Rennselaer and “managed his large estate scattered throughout the different wards of the city,” according to Nelson. Jarvis and his wife, the former Elizabeth White, had eight children. While living here Jarvis was also a principal of the American Gas Light Company and President of the Mechanic’s Fire Insurance Company at No. 2 Franklin Square. 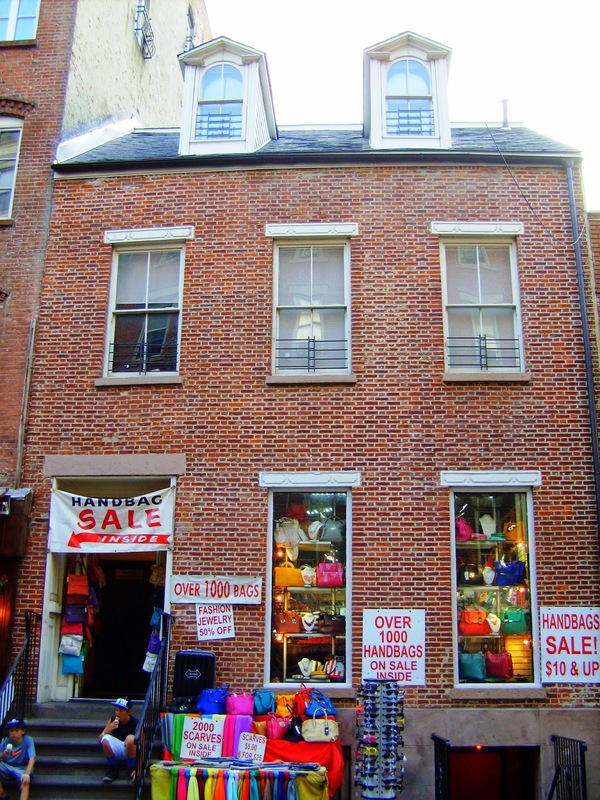 For inexplicable reasons, one year before Noah Jarvis’s death on August 11, 1842, the house was moved from the corner of Mulberry and Grand Street to No. 149 Mulberry—two lots away. As the decade drew to a close it was home to I. E. Hyde, then in the 1850s to the George Kellock family. Kellock ran the harness business of George Kellock & Son. Another son, James K. Kellock, ran his “telegraph” business from the house; while a third son George Kellock, Jr., was well known as the Superintendent of Outdoor Poor—essentially the 19th century equivalent of today’s Department of Homeless Services. By the 1880s the neighborhood around No. 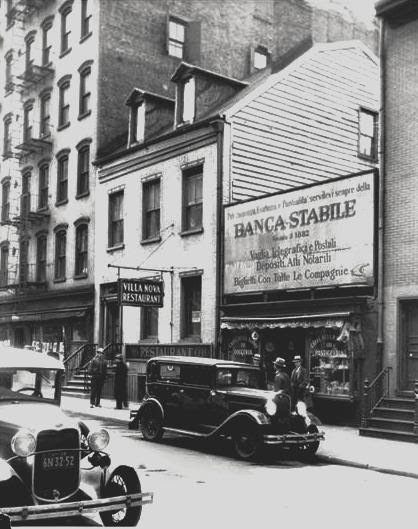 149 Mulberry Street, once an enclave of middle and upper middle class families, was crowded with immigrants and low-paid laborers as Federal style homes were demolished to make way for tenement buildings. Six months later the tenement next door at Nos. 145-149 Mulberry Street caught fire. “The burning building looked like a towering mass of fire,” reported The Sun on August 27, 1880, “and the tenements that clustered around it were in danger of destruction.” The residents of the burning building were all evacuated; but buildings to the rear and sides were also endangered. Firemen realized that containing the fire was “hopeless,” but poured water on the adjoining buildings, including No. 149 Mulberry. Despite their efforts, the house caught fire. “The only other building injured is a two-story and attic dwelling at 149 Mulberry street, with a brick front and wooden rear, and the blaze in this dwelling was soon extinguished.” No one was hurt, but the damage to the house was estimated to be around $400 or about $9,000 today. A variety of boarders lived in the house within the next few years while an Italian cheese factory operated in the basement. Lazarus Cohen, a tailor, was here in 1890 when he was caught registering to vote in two separate election districts. When he attempted to vote that November he was arrested at the polls. Anna Mertens lived here around the same time. On January 19, 1894 she petitioned $25 a week alimony from her husband, Herman, whom she said had deserted her. Within months all the boarders would have to find new homes, however. The neighborhood was by now known as Little Italy as the tenements filled with Italian immigrants. The extremely wealthy socialite and philanthropist Mrs. Anson Phelps Stokes purchased the house and converted it to The Free Italian Library and Reading-Rooms. The Free Library was also intended as a means to keep the impoverished children off the streets and out of trouble. On the second floor were two rooms—one for girls and the other for boys. The Sun said “In the rear is the room where girls may cluster about a big table and sew or play games or talk.” Reverend Antonio Arrighi, the pastor of an Italian church nearby, watched over the boys’ room from a desk there. Here the boys could play dominoes, checkers or parches. “An organ in the boys’ room and a piano on the library floor will give the Italian boys and girls a chance to sing and play on proper occasion,” noted the newspaper. By now there was a staff of 14 teachers for the children and in the basement was a clinic with several nurses “to care for childish ailments and instruct the mothers in the proper dressing of burns and treatment of sore throat,” said the newspaper. During the early years of the 20th century New York was plagued with Mafia-like and anarchist groups like the Black Hand. The organizations routinely terrorized citizens with bombings and murders and threats. The newspaper said that the explosion “shook the building to it foundations and poured plaster from the ceiling on the heads of the diners in Vergilio Caputo’s restaurant on the stoop floor.” One patron, Brian G. Hughes, ran out and kept going until he reached a barber shop down the street. “Bits of spaghetti with its tomato sauce and wet blotches of Chianti adorned Mr. Hughes’s clothing, for his dinner had been upset into his lap,” said The Times. Fifteen diners had been in Caputo’s and upstairs, in the Humbert Association’s rooms, were about 30 men. Vincent Selorani was one of the Humbert Association’s members there that night. He had been playing cards and was about to leave for home. As he went into the washroom to wash his hands, someone rushed by him on his way out. An instant later the bathroom exploded. Police surmised that the bomb was detonated by someone holding a grudge against the Humbert Association or one of its members, or perhaps by someone who had applied for membership but was denied. The restaurant’s owner, Virgilio Caputo was no choir boy, either. A year later, on October 17, 1912, he was held on $1,000 bail on the charge of intimidating a witness. Frank Demaro, who lived at No. 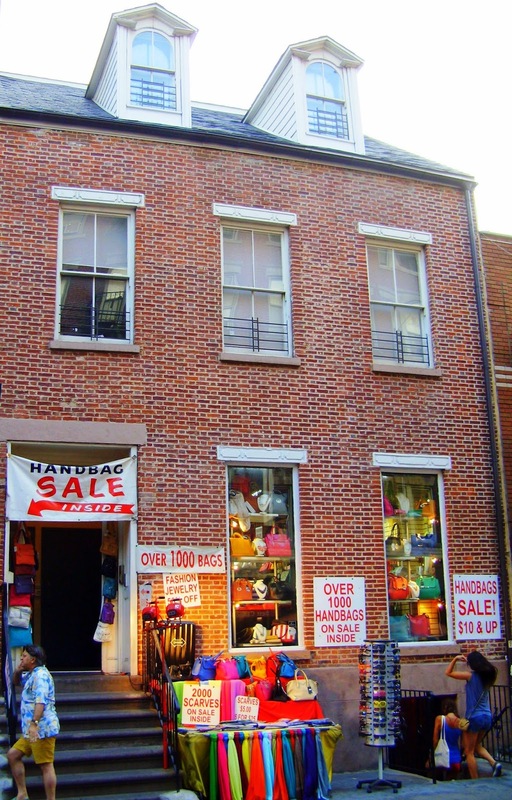 153 Mulberry Street, had charged Paul Degario of swindling him out of $54. On the day of the trial, Demaro was met on the steps of the Criminal Courts Building by Virgilio Caputo who “offered him $40 to leave town, with the alternative of a bullet,” reported The Evening World. A regular at Caputo’s restaurant was 25-year old Jerry Maida, a police informer. Siding with law enforcement in crime-ridden Little Italy was a dangerous game. On April 29, 1913 as he walked along West 41st Street he was gunned down. “Five revolver shots stretched Maida lifeless on the pavement,” said The New York Times. Police arrested the 19-year old shooter, James Jesto, along with cohorts Sante Barbara, Frank Tedesco, and Joseph Viscerta. Throughout the 20th century the parlor floor of No. 149 Mulberry Street would house an Italian Restaurant. In the 1930s it was home to Villa Nova Restaurant and for decades in the second half of the century it was Paolucci’s Restaurant. In 2009 the former house was converted to commercial purposes. A restoration of sorts cleaned and pointed the brickwork and replaced the decaying sections of the dormers. Although the entranceway has been totally redone, and replacement windows installed, the 1816 house is remarkably intact. The signage does not advertise a 'stable bank" = Bank Stabile. Rather, it is eponymous.